Saturday afternoon London and I drove to the Mojave Desert east of Barstow, California. We caravanned with our friends Jann and Gene, whom Vicki and I have known since before London was born. 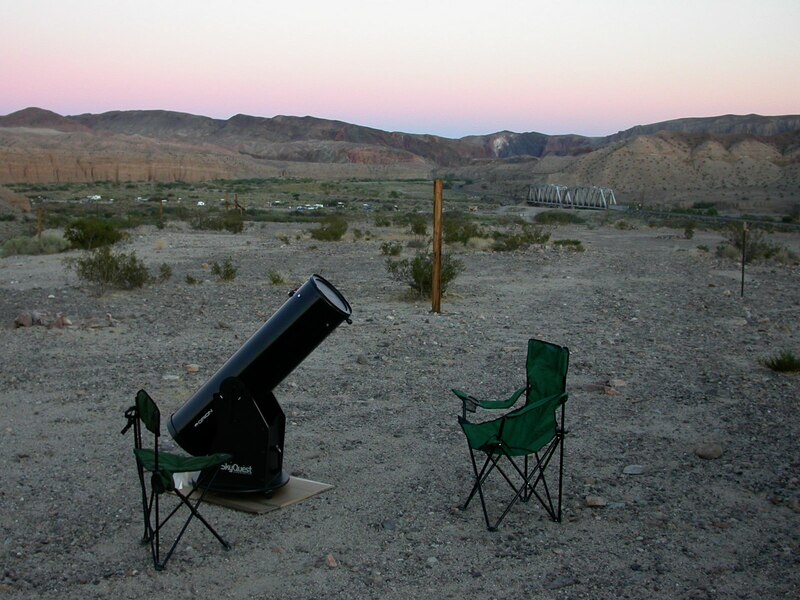 The San Bernardino Amateur Astronomers, Pomona Valley Amateur Astronomers, and High Desert Astronomical Society were all coming together for a big star party at Afton Canyon. 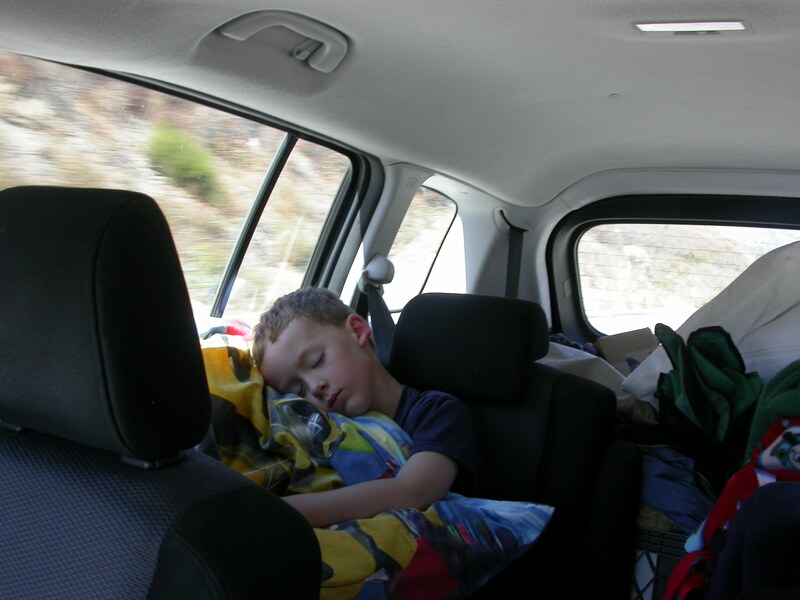 We missed that; the road down into the canyon had a few rocks big enough to potentially eviscerate my Mazda5 and Jann’s and Gene’s Honda Fit, so we camped up on the canyon rim. In the photo above, you can see some white picnic shelters down in the canyon. As it turned out, we had a fabulous evening even though we missed the official star party. We were just getting set up before dark when a sedan pulled up next to us, which turned out to hold my friend and fellow PVAA member, Gary, and his 13″ Coulter dobsonian. I had my 10″ Orion dob and a 5″ widefield reflector a tripod, and Gene had brought along his Celestron C90, so we had plenty of telescopes. This would prove fortuitous. We had just a few minutes to catch the very young crescent moon before it set, and then ate dinner while we waited for twilight to fade. 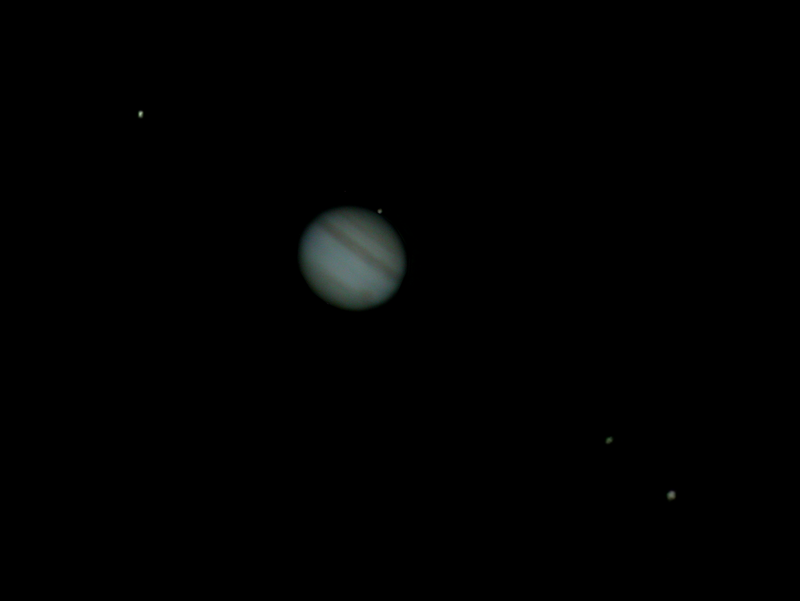 Jupiter and the Galilean moons, taken with my XT10 and Nikon Coolpix 4500. Click for the big, unlabeled version. M11, the Wild Duck Cluster. This was a sure crowd-pleaser. Epsilon Lyrae, the “Double Double” star, Lyra. These were just the things we had in regular rotation. I also had my green laser pointer and was using it to point out the constellations and some of the brighter deep-sky objects. M7, M8, M20, the Andromeda Galaxy (M31), the Double Cluster, and Brocchi’s Coathanger were naked eye visible. It was also a cinch to get people on target with binoculars by pointing with the laser and letting them follow the beam. I had along three pairs of binoculars, 7×35, 7×50, and15x70, and they all got used. We were seeing shooting stars throughout the evening, and I saw two that produced visible flames and left glowing trails across the sky. The sky, by the way, was very dark and very clear, probably the finest sky I’ve had for a big-scope observing session. The Milky Way was amazingly detailed to the naked eye even before the sunset had completely faded. The group observing wound down sometime around midnight. Our last few targets included nebulae in and around Orion–M42, M43, and the sometimes elusive M78–and the galaxy pair of M81 and M82. By that point I was tired of driving the big scope and also just plain tired, so for my last hour of observing I curled up in a camp chair with the 5″ reflector and just did some casual solo stargazing, with no plan or fixed destination. Number 3: seeing riffled edges on Jupiter’s cloud belts (the photo above does not do it justice), in the big scopes. Number 2: seeing the Double Cluster surrounded by an incredibly rich Milky Way starfield, in the 5″ widefield scope. I prefer to observe the Double Cluster with a wide enough field to get some nicely frame the two dense conglomerations of stars and to give some context. Prior to Saturday night, my all-time favorite view had been with 15×70 binoculars from Mount Baldy. The view in the 5″ scope was like binoculars on steroids–a nice wide field, but packed with wall-to-wall stars. I got that sensation, which I crave, of having so many stars in the eyepiece that it was almost exhausting to take it all in. Number 1: dust lanes in the spiral arms of M31. I first saw these for myself a couple of months ago out at Owl Canyon. Now that I know what to look for–and since I keep going to progressively darker sites!–these get easier and easier to spot. To me, it looks like someone got charcoal on their hands and dragged two fingers across the galaxy. The arms don’t show up as denser concentrations of light, but interruptions in the soft glow of the galaxy; not brighter but darker. I could see these in the 5″ scope, and they were sufficiently clear in the 10″ scope that people with no prior observing experience were seeing them right away. I remember how much of a kick in the brainpan it was when I first saw those spiral arms, and it was awesome to get to share that with others. In fact, having people to share the views with really made the night. If it had just been Jann and Gene, Gary, and London and me, I’m sure we would have had a nice time. But it was so much nicer to have interested people stopping by to show things to. I’d say that my enjoyment of telescope time scales directly with the number of people I get to observe with. I can have a fine time all by myself, and it only gets better from there. Stargazing was only half of the fun, though. This morning we had a lazy breakfast in camp while we waited for the air to warm up a little, and then we went for a hike. Gene had a GPS unit and the coordinates of a geocache, which gave us a general direction for the hike and an achievable goal. 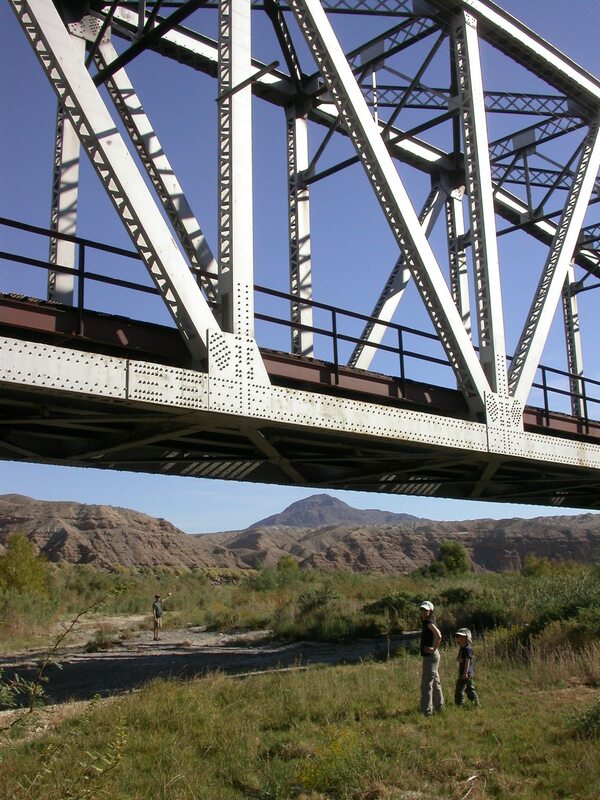 We followed the road down into Afton Canyon, crossed a dry riverbed under a railroad trestle bridge, and explored a very beautiful side canyon. Eventually our first route led us to a treacherous slope so we found another way back down to the bridge. We found a stand of rushes and a trickle of water, with lots of dragonflies zooming around. Jann had a field guide to dragonflies along, so she and London watched dragonflies while Gene and I pushed on to the cache. Gene’s GPS was getting satellite bounce that imparted some meandering to our path. At one point we found some old graves made of piles of rock with weathered, sunblasted wooden crosses, like something right out of the Old West. That was downright creepy, even for someone who works with cadavers. 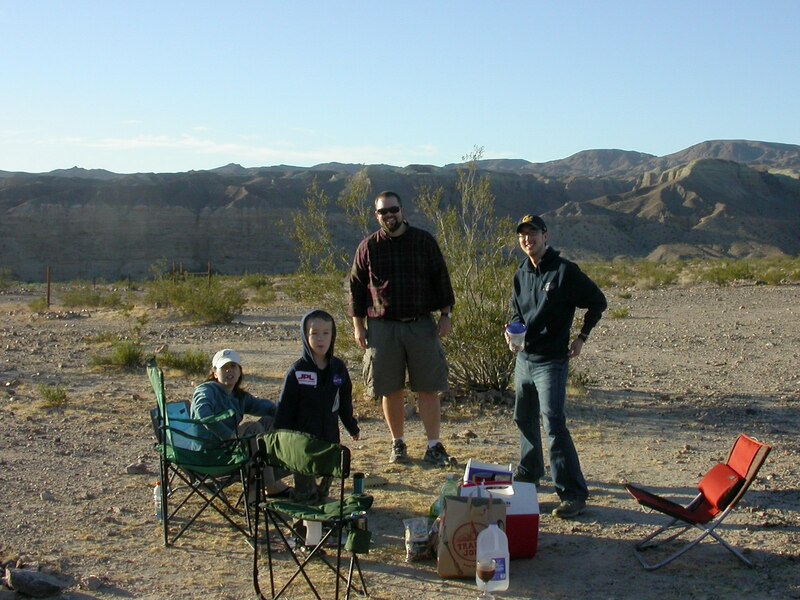 Eventually we did find the cache and sign the logbook, and all four of us enjoyed a leisurely stroll back to camp. 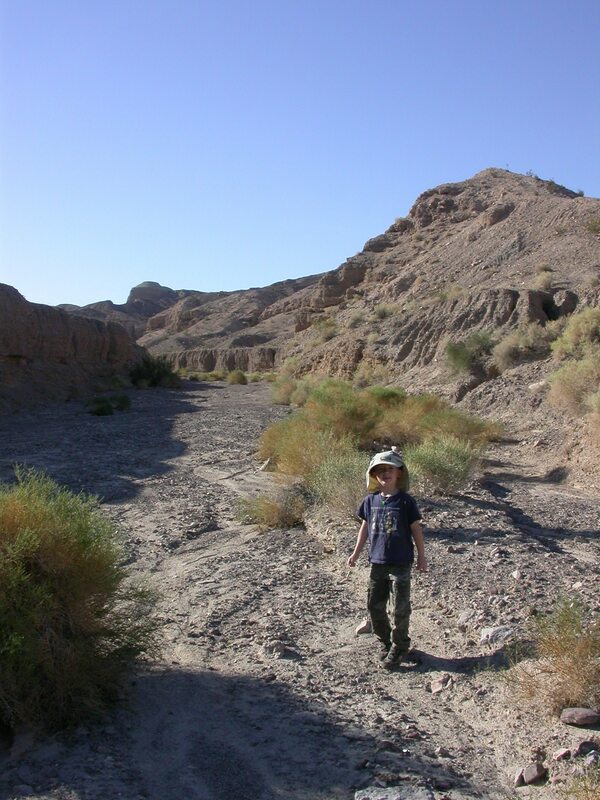 I’ve been fortunate to get out to the desert quite a bit this year–to the Salton Sea on several occasions in the spring, to Owl Canyon a couple of times, and to Joshua Tree Lake last weekend. This weekend’s trip was my favorite so far; the entire time I was exultant at being out at such a beautiful place. I’m already looking forward to next time. 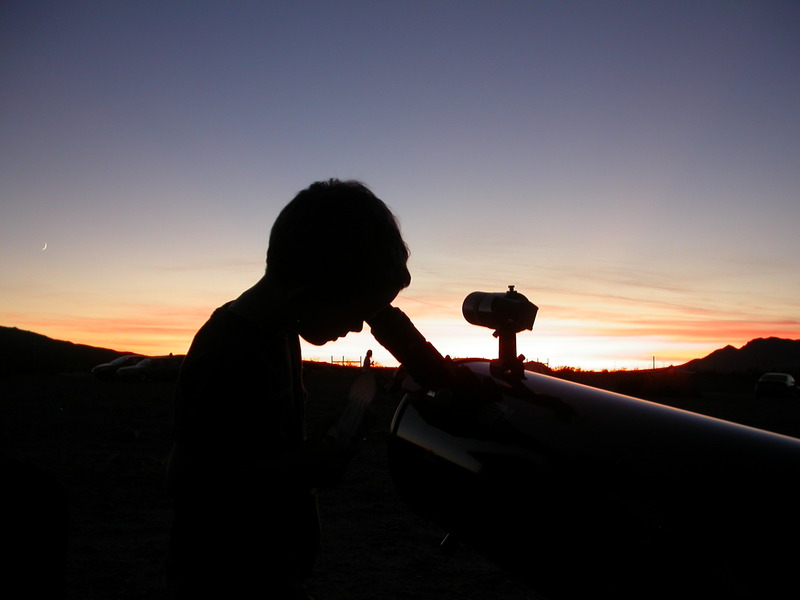 You are currently browsing the 10 Minute Astronomy blog archives for the day Monday, October 11th, 2010.